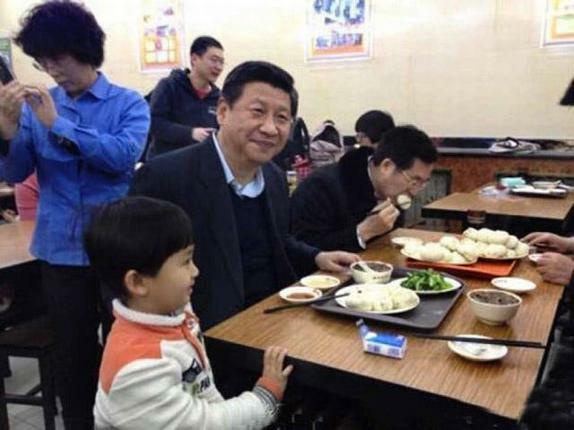 At noon on Saturday Dec 2013，President Xi Jinping arrived unannounced at the Qing Feng steamed bun restaurant.He queued up with the other people and paid for his food himself and chatted with other diners without a full security entourage.When he stood in line, many citizens came to shake hands and take picture with him. He ordered six pork buns, a bowl of fried liver and a plate of mustard at cost of 21RMB ($3.5). “Dada” means “Uncle” in the Shanxi dialect. “Xi Dada” means “Uncle Xi”.